Nathan Drake doesn't actually get hit by multiple bullets. He just runs out of luck. 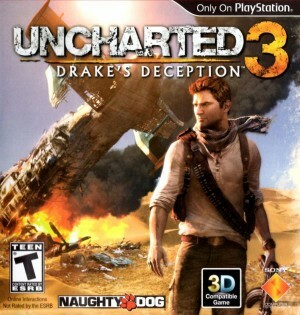 Uncharted 3: Drake's Deception is nearly upon us with a release date set for the day after Halloween. The latest launch trailer shows off a few new characters, and offers some hints about what's going on in the story. is one will be more your style. Check out this amazing footage of Naughty Dog's upcoming epic adventure. Naughty Dog reveals a new chapter in the thrilling single-player campaign. I had a chance to play a round of Sony's upcoming blockbuster tonight. Check out the first impressions. Sony has released a video showing off a bit of Uncharted 3: Drake's Deception's cooperative play, and it looks sweet. We chat about changes between Uncharted 2 and 3, crazy multiplayer maps, and boosters. The quality of craftsmanship going into Uncharted 3's multiplayer is astonishing, and this trailer and set of screenshots will have you dying to kill everybody in the world. Here's one woman Nathan Drake may not be able to charm his way past. Unsatisfied with Jimmy Fallon's terrible handling of Uncharted 3's controls? Check out footage of the burning chateau played by a professional.